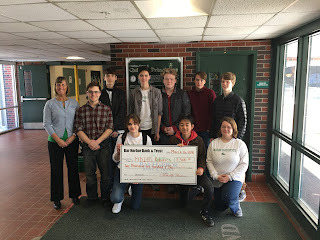 Bar Harbor Bank & Trust made a $2,500 contribution to the Mount Desert Island High School Robotics Team to help defray the cost for the team to participate in the World Competition, April 24-28 in Kentucky. The high school World VEX Robotics Competition brings together top robotics teams in the VEX I Q challenge, VEX Robotics competition, and VEU U under one roof to celebrate their accomplishments and participate with the best teams from around the world. Best wishes to the MDI High School team proudly representing the State of Maine at this event. Bar Harbor Bankshares (NYSE MKT: BHB) is the parent of Bar Harbor Bank & Trust with more than $3 billion in assets. Founded in 1887, Bar Harbor Bank & Trust is a true community bank serving the financial needs of its customers for 130 years. Bar Harbor Bank & Trust provides a full range of financial services through its 49 branch locations in all three Northern New England states of Maine, New Hampshire and Vermont. Bar Harbor Bank & Trust was named one of the 2017 Top 200 Publicly Traded Community Banks in the nation by American Banker magazine. For more information call 1-888-853-7100 or go to www.bhbt.com. Member FDIC. Photo cutline: At left, Lisa Parsons, SVP/Regional Market Manager of Bar Harbor Bank & Trust, presents a contribution to Tucker Atwood, Coach of the MDI High School Robotics Team, and team members (left to right, standing) Christopher Allen, Robert Denegre, Branden Dagenais, Lucas Ingebritson, Tyler Bechtold and (kneeling) Maev Rogers, Taki Ishimura and Gloria Kelley. Not shown: Coach, Megan McOsker and member Massimo Daul. These funds will help defray the cost for the team to participate in the World Competition, April 24-28 in Kentucky.